Bureau County, Illinois, is located in north central Illinois, about 120 miles (200 km) southwest of Chicago and 50 miles (80 km) north of Peoria. The Mennonites in the 1950s were located mostly in the southern part of the county. There were three Mennonite churches in the county, Willow Springs Mennonite Church (Mennonite Church (MC) ), four miles (6.5 km) southwest of Tiskilwa; Tiskilwa Mennonite Church (General Conference Mennonite), in Tiskilwa; Rockwell Mennonite Church (MC), in Sheffield. These three churches had a combined membership of about 220 in 1953. This made a Mennonite population of about 350 including the children. Culp, Emanuel I. "Bureau County (Illinois, USA)." Global Anabaptist Mennonite Encyclopedia Online. 1953. Web. 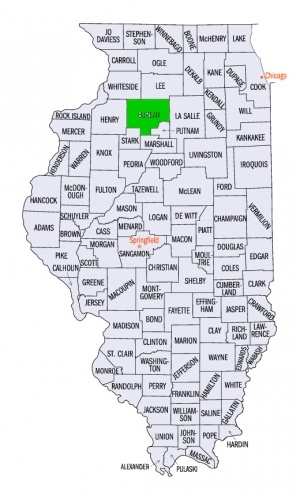 19 Apr 2019. http://gameo.org/index.php?title=Bureau_County_(Illinois,_USA)&oldid=91285. Culp, Emanuel I. (1953). Bureau County (Illinois, USA). Global Anabaptist Mennonite Encyclopedia Online. Retrieved 19 April 2019, from http://gameo.org/index.php?title=Bureau_County_(Illinois,_USA)&oldid=91285. Adapted by permission of Herald Press, Harrisonburg, Virginia, from Mennonite Encyclopedia, Vol. 1, pp. 471-472. All rights reserved.